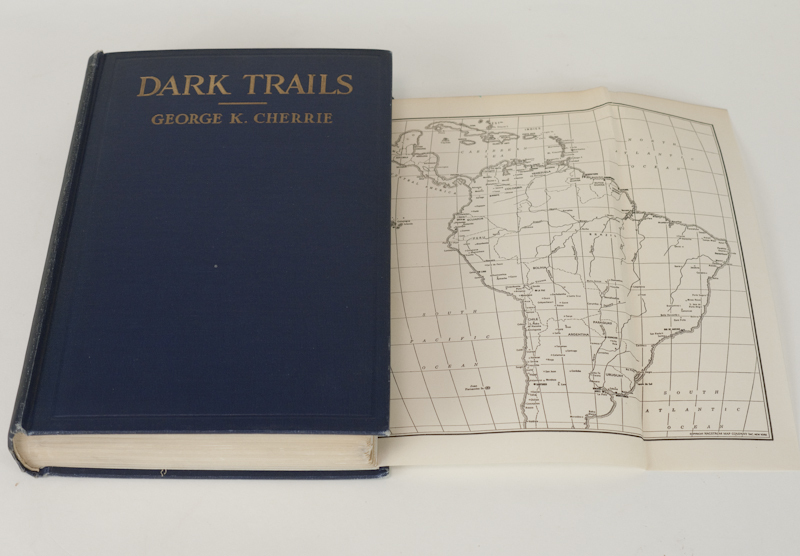 In his book Dark Trails: Adventures of a Naturalist (G. P. Putnam’s Sons, 1930), celebrated American naturalist and explorer George K. Cherrie wrote about his adventures around the world. Cherrie engaged in many expeditions, perhaps most famously accompanying Theodore Roosevelt on his nearly disastrous 1913–1914 jungle descent of Brazil’s Rio da Dúvida (“River of Doubt,” later renamed the Roosevelt River). The book provides a fascinating look at a prominent explorer’s enthnographic, botanical, and zoological studies, primarily in South America. Cherrie’s memoir reflects a generally hard-nosed skepticism one would expect to find in a man of science. For example, in a section where he recounts being a witness to faith healing among a South American tribe, Cherrie could be channeling James Randi half a century later: “Of course it was a piece of crude prestidigitation. But the widespread success of such charlantry testifies to the high value of mental suggestion; on the other hand, suggestion of evil [e.g., a curse] works with equal efficacy” (p. 48–49). For some years I have noted that when a group of people are thrown together for a few days or weeks, or sometimes for just a few hours, sooner or later the subject of ghosts will be broached. At such times there usually follows a period of silence. Then some one, with more or less diffidence, will relate an experience with what might be termed invisible or supernatural forces. Dr. S. Weir Mitchell, the famous Phila­delphia neurologist, held no brief for ghosts any more than I do. His life work with the inner mechanism of the mind and nerves should have tended, and doubtless did tend, to make him cynical regarding supernatural phenomena. But there is a strange story told of the great man, a story that he is said to have related many times himself. He told it in a way that left his listeners with a feeling that there was a question in the narrator’s mind as to its significance. The story was a curious incident of his medical career. The night was cold with snow whirling and drifting before a bitter wind. Dr. Mitchell was very tired. He expostulated with the child and suggested that there were other doctors at the local hospital. Besides, she was a stranger to him. But the little messenger would not be put off; there was something in the way she spoke that caused the doctor to relent. Bidding her wait in the warm front hall, he got into his clothing and great-coat and followed her. It seems that George Cherrie got suckered. This is, of course, a version of the venerable “Ghost in Search of Help” urban legend. As Joe Nickell has noted, “a book by Billy Graham contains a remarkably similar story, wherein the implication is that the little girl in the tale is not a ghost but rather an angel” and references a Reader’s Digest story. Predictably, however, “Graham provides no documentation beyond the vague reference to Reader’s Digest, which in any event is hardly a scholarly source. In fact, I soon discovered that the tale is an old one, circulated in various forms with conflicting details” (Nickell 2011). Indeed, in his Encyclopedia of Urban Legends, folklore expert Jan Brunvand (2012) notes that “Evidence suggests that Dr. Mitchell himself sometimes spread the story, possibly as a deliberate hoax” (264). It certainly wouldn’t be the first time that a genial but mischievous prankster accidentally launched a mystery when a little fib got out of hand and was later retold as avowed truth. It’s a good lesson for skeptics to question all extraordinary claims—not only from those with whom we may disagree or who may hold a different worldview, but also those whom we consider friends. An ounce of undue credibility can easily become a pound of mystery when compounded and spread by well-meaning but unskeptical folks. Brunvand, Jan Harold. 2012. Encyclopedia of Urban Legends: Updated and Expanded Edition. Santa Barbara, CA: ABC-CLIO. Cherrie, George K. 1930. Dark Trails: Adventures of a Naturalist. New York: G.P. Putnam’s Sons. Nickell, Joe. 2011. The doctor’s ghostly visitor: Tracking ‘the girl in the snow.’ Skeptical Briefs 21(2). Available online at http://www.csicop.org/sb/show/the_doctors_ghostly_visitor_tracking_the_girl_in_the_snow/. Benjamin Radford, M.Ed., is a scientific paranormal investigator, a research fellow at the Committee for Skeptical Inquiry, deputy editor of the Skeptical Inquirer, and author, co-author, contributor, or editor of twenty books and over a thousand articles on skepticism, critical thinking, and science literacy. His newest book is Investigating Ghosts: The Scientific Search for Spirits (2018).